Lately everyone is talking about strategies for improving upfront collections, providing estimates to patients sooner, clarifying patient expectations, and so forth. All of this is an effort to improve collection of patient responsibility. 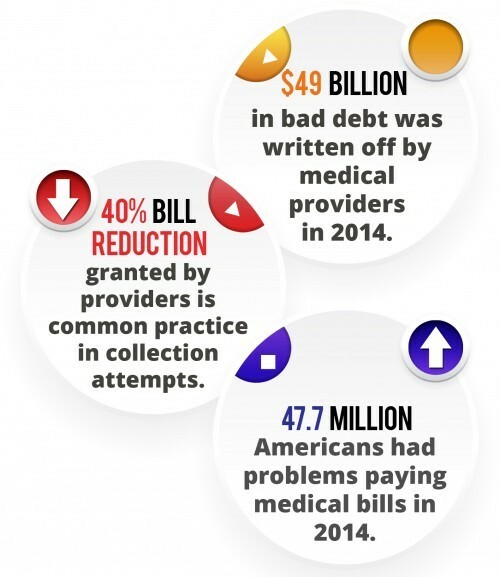 With the rise of high-deductible health plans (HDHPs), providers have been forced to adjust their collections processes in order to maintain financial health. According to a revenue cycle survey conducted by The Advisory Board Company, hospitals have doubled their median point-of-service collections over the last four years. I couldn’t agree more with Kerns; however, the current strategies being implemented are missing one very important segment of the market – those that are unable to pay regardless of how well informed they are. Now, I’m not saying that the current processes being implemented are not valuable; they absolutely are. I’m just pointing to another segment that cannot be overlooked. A report by J.P. Morgan found that the rate of bad debt for insured patients is increasing at well over 30% per year for some hospitals. We have spoken with many providers that describe frequent occurrences of patients canceling appointments after receiving an estimate due to inability to pay. This is something that won’t be captured in bad debt statistics but still accounts for lost revenue. An article published by HFMA states that patients are now responsible for 25-30% of all healthcare revenue. Now, more than ever, providers need options to give their patients that will allow the best chance for successful payment. Obviously it’s no surprise that I would recommend one of those options to be MyLoans. Full, upfront payment to providers perfectly aligns with the industry’s emphasis on upfront collections, all while patients are able to budget monthly payments with the ability to utilize pre-tax contributions from an HSA. We have to stop expecting providers to maintain financial health without being able to count on payment for their services.